The flagship Yamaha 9' concert grand piano, the CFX, offers sparkling highs and a powerful resonant bass with a sound that projects to the furthest reaches of any concert hall. The CFX was played by the winner of the prestigious International Chopin Competition in 2010, and has since gained recognition as one of the greatest concert grands of modern times. Originally founded in 1828, Bösendorfer holds a unique position amongst piano makers as the only manufacturer in the world still utilizing the Viennese tradition of hand-crafted design that produces the uniquely warm bass, singing treble and rich tonal colors known as the "Viennese Sound". The development of Bösendorfer pianos has been influenced by such famed composers as Brahms and Johann Strauss, resulting in an instrument lauded as the only piano capable of withstanding the frenetic playing of Franz Liszt. 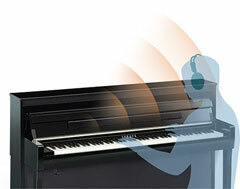 Yamaha advanced binaural sampling technology is now available on the Clavinova for the first time. The technology uses samples from the Yamaha CFX concert grand piano, recorded with specialized microphones that capture locational information and other nuances discerned by the human ear. The resulting sound is so natural, so enveloping, that you’ll soon forget you’re even wearing headphones at all. 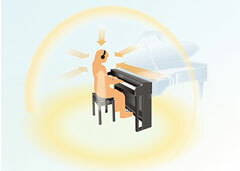 Once you choose the Yamaha CFX Grand Voice and put headphones on, the binaural sampled sound is automatically ready and no additional settings are required. Now with or without headphones, you can fully enjoy the concert grand experience at home. In a grand piano, sound resonates throughout the body of the instrument, producing a rich reverberation that envelops the listener in sound. 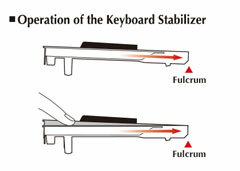 This phenomenon is reproduced perfectly in the Clavinova through enhanced Virtual Resonance Modeling (VRM). The original VRM calculates the various states of the strings for each of the 88 notes on the keyboard, from one instant to the next, and timing and depth of damper pedals pressed. The enhanced VRM now also calculates aliquot resonance in the upper octaves, and the full resonance of the soundboard, rim, and frame. This technology allows for vivid, bright, richly-varied expression that reflects the limitless number of factors inherent in piano performance. Featuring Yamaha Smooth Release technology, Clavinova offers the crisp tone heard when playing staccato as well as the lingering sound produced by releasing the keys gradually. This provides finely-nuanced response to the pianist's playing. Natural Wood X (NWX) keyboards are created using unrivaled expertise that Yamaha has acquired through more than a century of crafting fine pianos. Just as with grand pianos, the material used for Natural Wood X keyboards is cut from wood that has been carefully dried specifically for use in making musical instruments. Only the best wood from the finest part of each tree is selected, resulting in a keyboard that is more resistant to buckling and warping than common laminated wood keyboards. The Yamaha Natural Wood X keyboard features a three-sensor configuration, which accurately senses and interprets the behavior of the keyboard for a response that feels very similar to that of a grand piano. 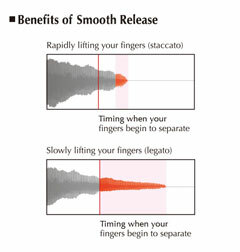 This allows you to vividly perform smooth, flowing passages or light trills, techniques used in many pieces such as Für Elise. 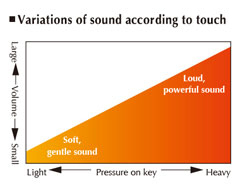 Our fingers are more sensitive than we think, and for pianists, the texture of the piano keys is extremely important. 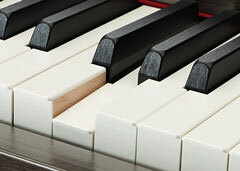 The NWX keyboard features white keys made from the highest quality synthetic ivory, developed independently by Yamaha. The black keys are finished in synthetic ebony. 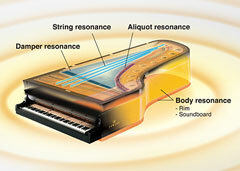 Synthetic ivory keytops reproduce the tactile surface of the real ivory keyboards once used in older acoustic pianos. It features highly absorbent material that prevents fingers from slipping even after hours of practice, while retaining the ideal texture and feel. Resulting from well over a century of experience in making acoustic pianos, this exclusive Yamaha technology achieves a finish that feels natural and comfortable. In addition to the feel, the appearance and fine texture of these keys is unmatched by any other digital piano, and is sure to inspire pianists from the moment they experience it. 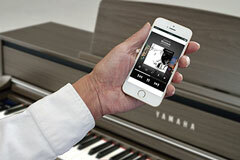 You can play music through the audio system on the Clavinova by using a Bluetooth-enabled smart device. You can stream audio data such as mp3 files, as well as audio from apps. You can enjoy playing along with any of the songs from the music library on your smart device. The recording function featured in Clavinova digital pianos allows you to record your performances* with a single touch, which is useful when you want to review your playing objectively. Additionally, you can record up to 16 tracks for simultaneous playback, so different hands can be recorded separately or overdub parts with different Voices. 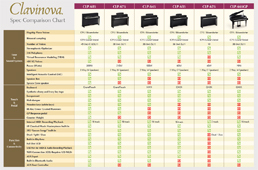 Connect the Clavinova to a computer or portable device to interact with a variety of educational, entertainment or creative applications.